So I may be a little late to the party, but I just discovered Amazon Mom!!! You get the benefits of FREE 2 day shipping, plus other great deals like 30 % off diapers and wipes with S & S. And you get special savings on a host of other baby and toddler needs as well. Sign up with Amazon Mom. Find the diaper deal that you are looking for. 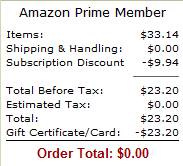 Accumulate Amazon.com credits from Swagbucks and pay nothing!!! Below is my order for a pack of size 3 Huggies diapers. They would have been $23.20 (which is an amazing price for a 156 count pack! ), but I paid nothing because of my credits from Swagbucks. Love that they did this amazon mom thing. It’s really working in their favor too. I NEVER bought diapers online before they started this promotion (and the one right before it too). Now unless there is a fantastic deal at CVS, I only buy my diapers through Amazon! Yes, I have been doing the Amazon Mom thing with S&S for gDiapers and it’s great! I am saving so much on the gdisposable inserts that it’s cheaper AND better for the environment than disposables from the store. I LOVE Amazon.com.